Over the last few years, Medium has quickly turned into my favorite place to publish and read. It’s a democratic haven where the most interesting articles will excel. Everyone’s success is determined by the strength of their writing, not their following. After reading and writing many popular articles we were determined to find the key elements that pushed those articles to the top of Medium. We started by cataloging the Most Recommended Articles in January and a separate control group. Then analyzing each individual article, giving us 50+ pieces of data on each article. After those 10,000 or so data points were compiled we looked for the most helpful trends. Which you can see below! First we analyzed how easy to read the most recommended articles in January were. We used the Automated Readability Index, which assigns a level of education required to read and understand each article. For example, How To Hire requires 5th-grade reading abilities to completely comprehend. Writing for a 6th-grade level was found to be the most effective by far. An article that could be read by a 6th-grader or below received 20% more recommends, on average. In layman’s terms, an 11–12-year-old child could comprehend those articles. Additionally, articles written at a 7th-grade level fared better than those at an 8th grade level with 21% more recommendations. The average Medium articles also seemed to follow a similar trend. With the most recommended articles averaging a 6–7th grade reading level. But overall the articles averaged a 9th-grade reading level. Paulette Perhach wrote at a 6th grade level for The Story Of A F#&k Off Fund. Which received 75% more recommends than the average. After observing the ideal grade level needed to understand articles, we dug deeper. To determine if the average length of sentences had any impact on total article recommends. Using the Hemingway Editor we were able to find the total number of sentences in each article and then compared it to the total number of words. Because picking a single value for words per sentence could be misleading, we instead compared predetermined ranges. The ideal length ranges were then selected by the most recommends on average. Articles averaging 12–15 words per sentence had 20% more recommends. Compared to those with 9–11 words per sentence. Illustrating that the top writers are using short but impactful sentences to get a point across. Looking at the group as a whole, the most recommended articles averaged 14 words per sentence. Far lower than the control which averaged 17 words per sentence. How to Wake up at 5AM and Build Your Startup by Min H. Park was able to average 13 words per sentence. In addition to the length of sentences we also looked at how easy to read each sentence in our dataset was. In an effort to find the ideal threshold of easy to read sentences needed to make it an easy to read article. And how that will affect total recommends. We defined that threshold as one with 75% or more sentences that are easy to read. With that in mind, we found that an easy to read article leads to 43% more recommends, on average. To further clarify, hard to read sentences are dense, use verbose words, have no structure or are simply run on sentences. This can be measured with a simple tool like the Hemingway Editor. It highlights the sentences that are hard and very hard to read in each article. The Top 5 Most Recommended articles all kept the easy to read sentences above a 85% threshold. And the average group supported this claim with an on average 62% more recommended for easy to read articles. What I learned not drinking for two years by Andy Boyle was the most recommended article in January and kept hard to read sentences to only 10%. He was able to get 6100 recommends for that effort, over double the overall average. Shooting for a “time to read” goal could seem a little weird for blog writers, but it is an important part of Mediums charm. It is one of five things someone could see before they click on an article. I have avoided many articles before based solely on their estimated time to read. Boost recommends by at least 20% by writing for 6–7 minute read time. And at least 40% more recommends than writing for 5 minutes or less. 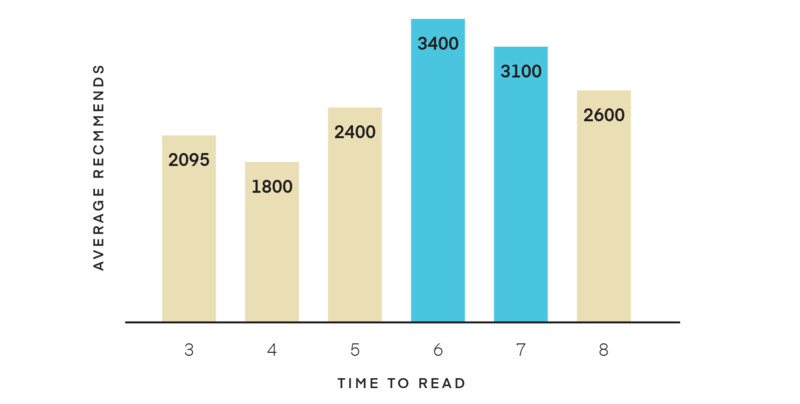 The average time to read for the Most Recommended Articles was 7.3 minutes. Much higher than the 4.9 minutes for the rest of our sample. According to Medium: “Read time is based on the average reading speed of an adult (roughly 275 WPM). We take the total word count of a post and translate it into minutes. Then, we add 12 seconds for each inline image.”So there is their “secret formula”, you have no excuse for not knowing what it is before publishing! Power words like sad, powerful, best or great are trigger words that grab the reader’s attention immediately. They stand out like a beacon against the other common words that make up most titles. To identify power words we ran every title through the CoSchedule Headline Analyzer and found that using one power word in your title can increase recommends by 21%. 6 out of the top 10 recommended articles use at least one power word in their title. Additionally the Most Recommended Articles averaged double the amount of power words in their title compared to the control group. The “Other Side” Is Not Dumb by Sean Blanda used one power word, dumb, in its title for 50% more recommends than average. Using title case or sentence case for your title may be the last thing on your mind before publishing. But it can have a very measurable impact and was one of the first things we wanted to test. On Medium those articles using sentence case performed better than title case, averaging 20% more recommends. We also saw an interesting trend between case usage in the title and what tags the articles carried. About 70% of the Business articles about startups, tech or coding were clearly using title case. On the other side, Social articles about life lessons and the like were mainly using sentence case. With 68% of those type of articles using it. Why I work remotely (hint: it has nothing to do with productivity) by Jason Zimdars used sentence case for 20% more recommends than average. Including a call to action is a well-known best practice for writers and content producers. It is an incredibly simple and quick addition to any article. But we found that barely over half of the most recommended articles used a call to action. An incredibly easy to execute example can be seen below. Which was from the second most recommended article in all of January. Those who did include a call to action led to 25% more recommendations, on average. 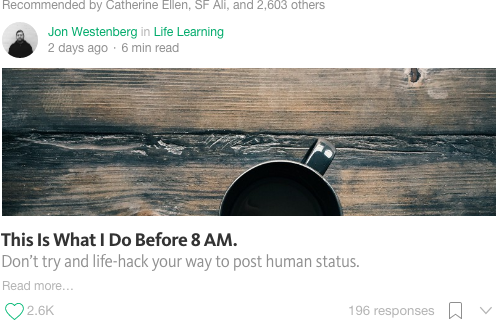 On Medium a call to action can be as simple as asking for a recommend, follow or share. Again it is one of the quickest things that you can do to increase recommends. Picking the wrong day to publish can be detrimental to total recommends. Very quickly your article can be lost in the minutiae of a busy work day. To combat this we found that Tuesdays and Saturdays are the best days to publish. Publishing on Tuesday instead of Monday or Wednesday could lead to almost 76% more recommends. By publishing on Saturday you can get 33% more recommends than average, and 56% more than publishing on Sunday. 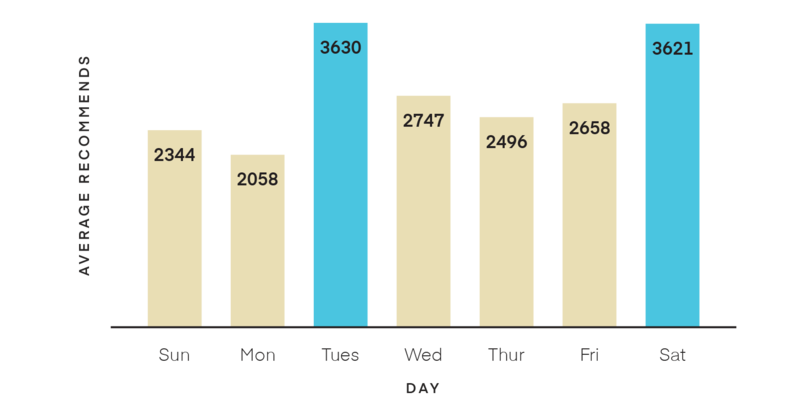 If you choose to publish on Monday, the least popular day, it could lead to 25% less recommends then the total average. Year Of Conversational Commerce by Chris Messina was published on a Tuesday to 30% more recommends than average. Medium is an incredible platform with many users and will continue growing. As it continues to grow becoming a top recommended article is becoming more difficult. Write for a 6th-grade reading level. Use a power words mixed with sentence case styling to make the title unique and memorable. Write sentences that are concise and average 12–15 words. Keep time to read around 6 to 7 minutes. Never publish on Monday but instead shoot for Tuesdays or Saturdays. Use a simple call to action to action to end all your articles for the most recommends. 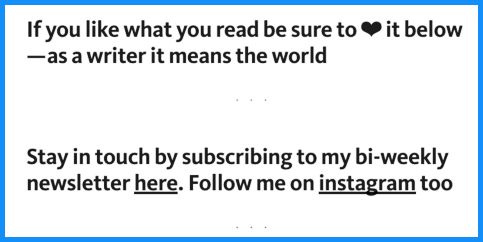 Following the above advice will push your already great content to the top of Medium. And maybe we will be studying your article next time.